Hip dysplasia is among the most common birth abnormalities and is the leading cause of hip arthritis is patients under the age of 50. Fortunately, PAO is a safe and effective treatment option available to many patients. 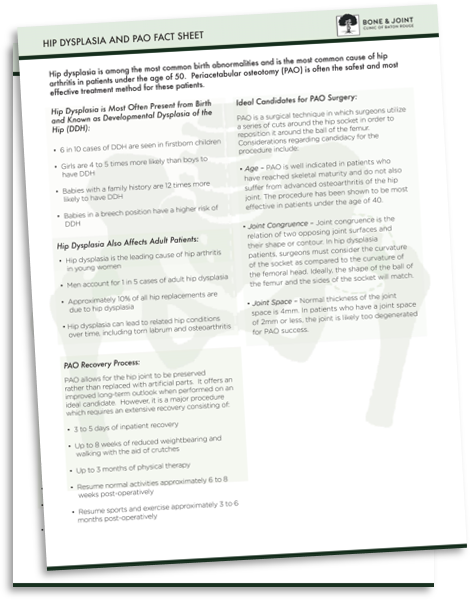 Simply complete the form in the right-hand column to download the complete PAO Hip Surgery Patient Kit today. © 2017 Bone & Joint Clinic of Baton Rouge. All rights reserved. PrivacyPolicy Site Managed by BlinkJar Media.